Stone House was built over the winter of 1853-54, when California had been a state only three years, and Lake County did not yet exist. It was constructed by 24-year-old Robert Henry Sterling, manager of the 21,200-acre Rancho Guenoc, on which Stone House is located, and the adjacent 8,242-acre Rancho Collayomi. Both were owned by Capt. Alexander A. Ritchie. Newly retired after 10 years at sea, Sterling had convinced his fiancée to come around the Horn from Connecticut to join him. With the help of Capt. R. Steele and a small tribe of nearby Indians, Sterling was responsible for thousands of head of cattle and charged with keeping “squatters” off this valley land in the northernmost reaches of Napa County. When Lake County was created in 1861, the Sterlings had moved to Napa, the cattle were gone, the lands and Stone House sat idle awaiting probate of Ritchie’s estate. Briefly, Stone House played roles as general store, meeting house, dance hall, polling place and post office, and private residence before it was finally sold in 1872. In 1950, Stone House was determined by the California Centennial Committee to be the oldest building in Lake County. As such, it was designated State Historical Monument No. 450, and a plaque was installed near it on State Highway 29. In 2012, a group of volunteers headed by Andy Anderson constructed a back porch design to emulate the gridwork of the original front porch. It is now the primary entrance into Stone House. The Stone House Historical Society meets the first Tuesday of each month at 10 am in the Activities Center next to the HVLA offices. Non-members are always welcome at our meetings. At meeting times, and for our open house tours, non-residents can leave your name at the Hartmann Road gate and tell the guard you are visiting the Stone House. 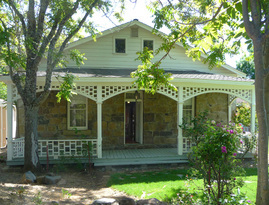 Stone House is currently open for viewing only by appointment. We will hold an Open House in conjunction with our annual Christmas Party December 5, from 4 to 6:30 pm. Membership in the Society is open to all. Whether as an active participant or sustaining donor, annual dues are $12 for an individual, $20 for a couple. 2014 officers are president Don Mancuso; vice president, Georgeann Tintorri; secretary Diana Mancuso; treasurer Jean Bundy and membership chair Bonney Jorgensen. Send email to stonehousehistoricalsociety@gmail.com, write to Stone House, 18174 Hidden Valley Rd., Hidden Valley Lake, Ca 95467 or phone 707-987-9297. Coyote Valley Elementary School third-graders make an annual tour through Stone House each spring. We are always impressed by how well behaved the children are and the intriguing array of questions they ask. We also tremendously enjoy the thank you letters they write. Enjoy a few here. "A Little Bit of History about the Oldest Building in Lake County," a booklet that summarizes the history of Stone House.